i finished it! woo hoo! it's rather small but awfully sweet all the same. 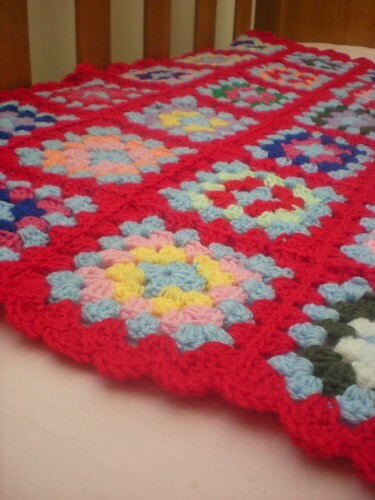 it sure puts the 'granny' in granny square blanket i think. tee hee. i actually found joining all the squares up and doing the border more enjoyable than crocheting the squares themselves. funny because i was dreading the joining part. so my first ever granny square blanket is complete and it feels good, literally. 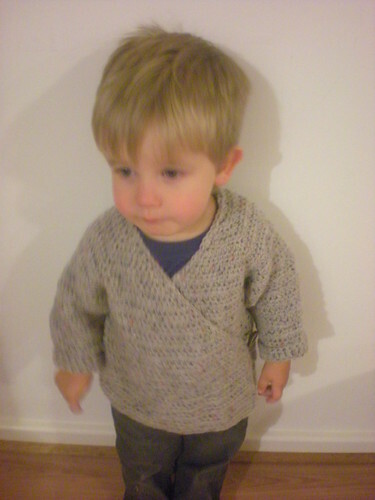 i also found the wrap jumper for harrison which wasn't quite finished. i finished it and it fits him with growing room. instead of ties i sewed on some little leather buttons for a more manly look. i took a heap of photos but harrison wasn't in the mood for playing model and my camera doesn't like people that constantly move. and then i modified the pattern a bit and made one for the dolly. 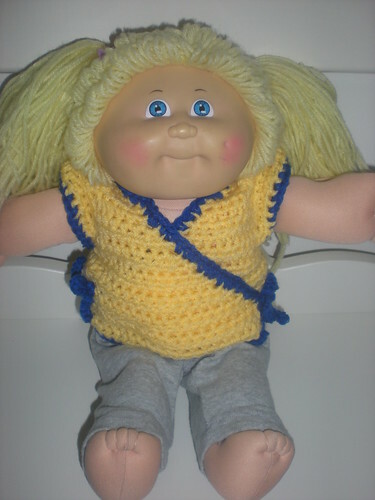 it was supposed to be for lachie's teddy but it fitted this doll perfectly. not the nicest colours by dolly loves it and she doesn't mind the cheap acrylic yarn one bit! 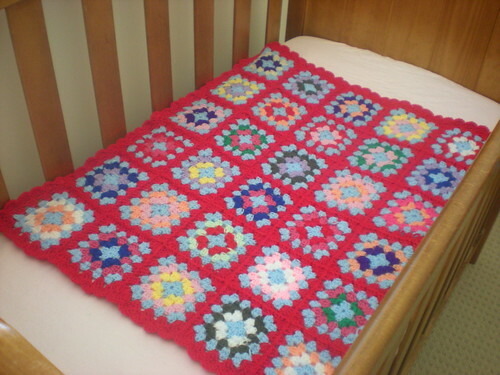 if you would like to make one the pattern i used was written by susanne visch and can be found here. and if that 'here' link worked then i have to thank cinti from my poppet for telling me how to do that high-tech stuff. and she can be found.. wait.. i'm gonna do it again.. here! in other news i have become an active commenter. yep, i'm throwing comments on peoples blogs left right and centre and even 'following' them. so brave! maybe i'll even gain a few more followers myself. can i possibly get to five followers one day? one can only hope. then i'll know i've really made it. :) i don't get a lot of comments on this blog but i have had a few lately and it's such a lovely feeling so i thought it's about time i commented a bit more on other peoples blogs instead of quietly stalking them anonymously. if you read my blog and you have your own blog please comment below because i would love to have a look! did you have a lovely easter?